One of the last Performa series computer, 6400 featured 200MHz PowerPC CPU and up to 136MB of RAM (40MB in new units. It had a new "SRS 3D surround" sound system and a subwoofer built into the case. The case was a tower with rounded edges. It was one of these typical Performa cases in which all components could be removed by sliding out. It came with Mac OS 7.5.3 and later 7.6. 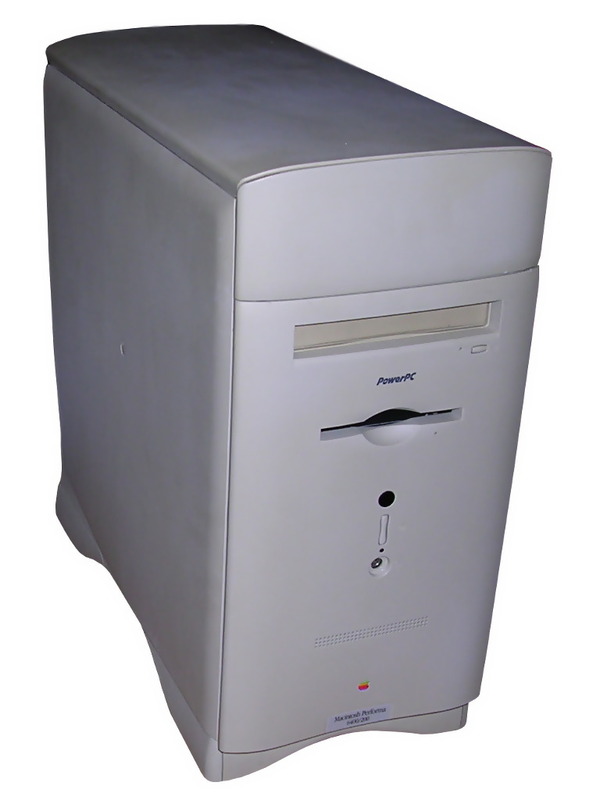 Performa 6400 could run Mac OS 9.1. It's possible to install 9.2.2, but it requires advanced patching. There was a "Video Editing Version" of this computer, sold upgraded with video capturing / decoding card and QuickTime software. Some American versions had a ZIP drive. Floppy drives: 1 1.4M 3.5"
Graphics: 640x480x16bit - 1024x768x8bit(1MB VRAM). Sound: Built-in speaker with subwoofer, jack in/out. - Apple Design Keyboard and Mouse. My unit was used as a home computer somewhere in Silesia. During hard disk upgrade something went wrong and ribbon cable was damaged by sharp edge of case. Then it was put to basement after few futile tries to replace ribbon cable in harness. Finally I fixed it by attaching the cable directly to harness, not perforating it in another plug. It works well now. To remove any drive, remove front cover by pulling it from locks on the bottom. Now you can slide all drives out of the casing. To remove mainboard, remove 2 screws holding it on the rear and slide it out of the casing. Then, the adapters may be installed. The best thing to install here is Mac OS 8.x or 9.1 - to install 9.2.2 you have to patch it, to install 7.5.3 you must have version suitable for this computer, as system enabler (computer's driver) is about 500kB so it won't fit on any 7.5.3 boot diskette.